Aretha Franklin’s name in popular culture has come to mean more to us than just the voice behind so many of the best records of the twentieth century. 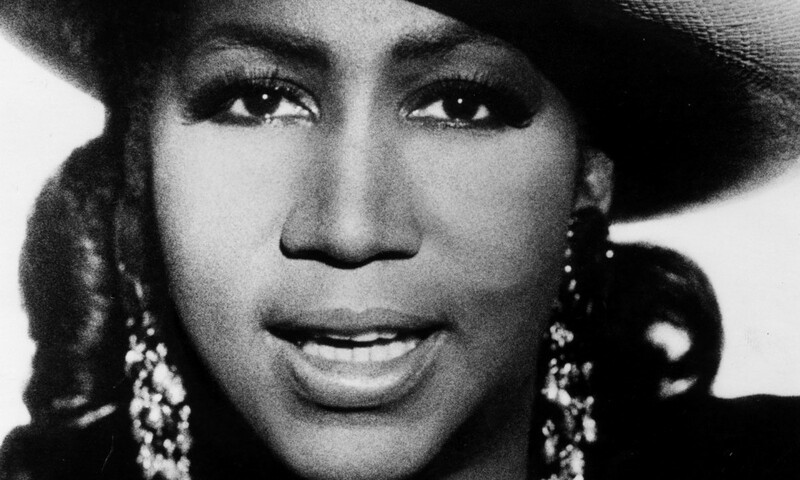 Aretha grounded us in what mattered: love, community, civil rights, belief in a spiritual intelligence that united us – be it Jesus or a notion of freedom for all. What’s not in dispute is that she was the best singer ever to grace popular records. Any singer who ever got near a microphone wanted to project even a drop of her super power. She had everything in her voice a singer could dream of, and she was a soulful piano player who could accompany herself and lead a band. We believed her when she said up until that point “life was so unkind.” It’s a love letter of gratitude to someone who raises you up. I’m certain my father was writing it to my mom, and those words could be sung in churches as a song of praise. But Aretha made this one of the most iconic female songs of all time. In 2015, my mom invited her whole family to the White House to witness her receiving her the esteemed Kennedy Center Honor, alongside George Lucas, Rita Moreno, Seiji Ozawa, and Cicely Tyson. My mother’s generosity is one of her hallmarks. For her, it’s always been family first. I got to pose in a group photo with my arm around President Obama’s waist. My phone is full of behind-the-scenes moments, too many to count. I was raised right by both my parents: I’d rather be respected by those I respect than dare to squander a celebrity’s trust by asking to take a selfie with them. Saturday, December, 5, 2015, the night before the filming of the famous broadcast, there was a dinner with a black tie dress code in the White House State dining room, where honorees were to receive their Kennedy Honor Medallions. James Taylor made the presentation to my mother. The performers for the following night were still supposed to be a surprise, but James Taylor was most definitely in the House. We were all seated and into our dessert when another cat was let out of the bag. Aretha nonchalantly walked across the room with little fanfare, wearing that coat, which in time earned the worldwide hashtag #coatdrop after her performance the following night. We all know what happened next: Aretha played, she sang, she hit that note and dropped her fur coat! My mother grabbed her heart, President Obama cried. We all cried. And damn, to be there in person was reason enough for bragging rights. On the plate to my left was Aretha’s name. All I could think was, “I’m not worthy! What will I say to her?” I sat next to her the whole dinner after her iconic performance, and damn if I was going disappear into feeling shy for the whole of the night! People are people, and I’m gonna be social! 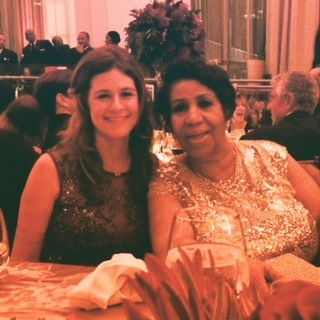 Although I didn’t dare ask Aretha to take a selfie with me, my niece who was watching the whole encounter wisely snapped a photo from across the table on her phone. I think I did good. I read an interview with Aretha a year later where she said she had met Carole’s daughters and they were so nice. Later I wrote a song for her to sing and sent it to Clive Davis. It took eight months for me to get Clive on the phone, but it was baptism by fire. 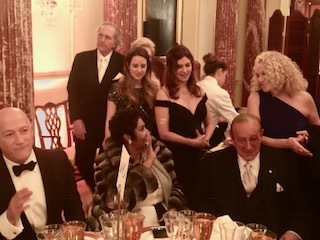 The esteemed honorees of The Kennedy Center all received Laurels and Medallions, but I will forever cherish the honor I received: that of zipping The Queen of Soul back into her gold dress. Louise Goffin is the daughter of Carole King and songwriter Gerry Goffin, as well as an Grammy-nominated singer-songwriter.